The Langtang valley is situated directly north of Kathmandu in the Central Himalayan Region. In a southern section of the park lies a small area of subtropical chestnut forest, along with unique Sal forest. The hill forests (2000–2600m) across the southern slopes of the park consist of Chir Pine, Rhododendron, Nepalese Alder and Oak. Moving north and higher, the Mountain zone (2600–3000m) contains mainly Mountain Oak, fading to Silver Fir, Hemlock and Larch in the lower sub-alpine zone (3000–3600m). Throughout these zones, several species of rhododendron trees form a twisted and colourful canopy. Continuing higher to the tree line, Birch and Fir forest are the last to survive. It is here at 3600–4000m that Juniper and Rhododendron shrubs slowly dissolve into the expansive alpine grassland meadows. The elusive snow leopard is still thought to comb these alpine heights for prey. The park is also well known for its populations of red panda, Himalayan black bear, wild dog, Himalayan thar, ghoral (mountain antelope) and more than 250 species of birds. Above the tree line, the valley opens up into a classical, glacial ‘U’ shape, bounded to the north by the impressive Langtang Himal, beyond which lies Tibet. The major peaks include Ghengu Liru (Langtang 2 (6571m)), Langtang Lirung (7425m), Kimshun (6745m) and Shalbachum (6918m). To the south, the Chimsedang Lekh forms a ridge of peaks, which includes Naya Kanga (5846m) and Gangchempo, Tilman’s beautiful Fluted Peak. Further beyond, it extends to the Jugal Himal, terminating in Dorje Lakpa (6980m). To the east, the upper meadows of the Langtang end in a massive mountain wall, forming the frontier with Tibet. Langtang remained unknown and mysterious until Bill Tilman’s exploration in 1949. Following Tilman came Toni Hagen in 1952. Both ventured up the Langtang high valley and glacier, probing for routes into Tibet. 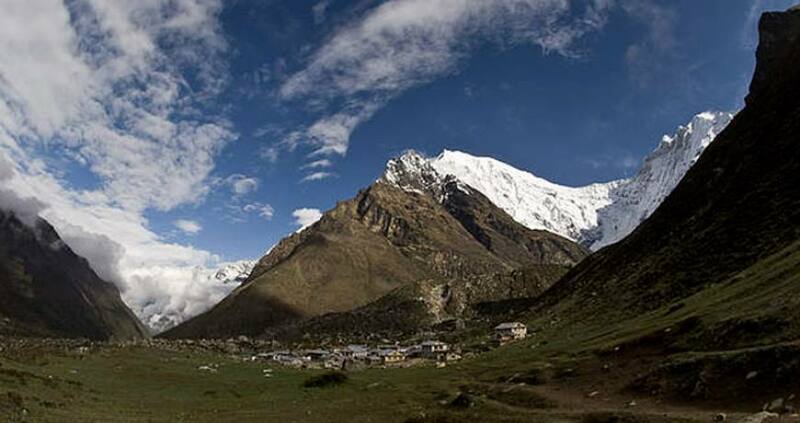 Langtang is at present the third most popular trekking area in Nepal, after the Annapurna and Everest regions. This fabulous trek is a perfect combination of moderate and vigorous walks leading to a high alpine valley with a backdrop of high snow-capped peaks. In spring this place is alive with wild flowers. Why not become a pilgrim and head to the shimmering lakes at Gosainkund? There you will find peace and serenity alongside the Buddhist and Hindu pilgrims. It is no wonder that this area is sacred, affording views extending all the way to the Annapurnas. Cross the Laurebina Yak La Pass (4615m), adjoining the Gosainkund and Helambu regions. At this higher altitude, the terrain is transformed into arid alpine above the tree line, and the villages become more sparse. The path descends on steep mountain trails high above the valley. Culturally, Helambu is one of the wealthiest regions in Nepal. Predominant in this region north of Kathmandu are peoples of Tibetan origin. Day 01: Drive to Sybru Bensi (1462meters) by bus. 8 hours. Day 02: Trek to Lama Hotel (2500meters) 5 hours. Day 03: Trek to Langtang Village (3307meters) 5 hours. Day 04: Trek to Kyanjin Gompa (3798meters) 4 hours. Day 05: Trek to Lama Hotel (2500meters) 6 hours. Day 01Drive to Sybru Bensi (1462meters) by bus. 8 hours. From Kathmandu, we take seven- eight hour drive to Syabru Besi. Daily buses leave for Syabru Besi from Bus Park. Kathmandu via Trishuli to Dhunche 1950m. Road is all rite except some landslides in between so have to change buses in the middle. Overnight at guesthouse. Day 02Trek to Lama Hotel (2500meters) 5 hours. Today, the first part of the trail crosses through Bhote Koshi and follows the Langtang Khola. This trail gradually ascents up to Bamboo passing through Landslide. Afterwards, your trek ascends gently to Rimche (2400meters) through Bamboo (1960meters) which lies at the bank of Langtang Khola. You can have lunch at this place if you like and at the end your trail is level to the Lama Hotel. En route you could see red pandas, monkeys and bears if you are lucky. Overnight at guesthouse. Day 03Trek to Langtang Village (3307meters) 5 hours. From lama hotel, we continue gently ascending above the Langtang Khola. As the trail progresses, it becomes steeper. From time and again we can have the most exotic sights of Langtang Lirung lying at 7246 meter. The trail leads to a log bridge and on climbing further we come across lush meadows of Ghora Tabela at 2992m. We will see several lodges and a police check post. Further on, the route opens up into a wide valley of yak pastures and scattered Tamang villages showcasing water-driven mills and prayer wheels. On descending for a while, we arrive at Langtang village after crossing a stream and reaching to the height 3430 meters. Langtang village is the headquarters for Langtang National Park and has flat-roofed Tibetan style houses, hotels and cultivated lands yielding buckwheat, potatoes, wheat, turnips, barley etc. Overnight at guesthouse. Day 04Trek to Kyanjin Gompa (3798meters) 4 hours. The trail skirts gradually through rich yak pastures and interesting traditional villages of Muna to Singdun. We cross a wooden cantilever bridge and reach a wide valley after climbing a moraine. Finally, on ascending along the mountain passes we arrive at Kyagjin Gompa. There is a small monastery and a government-operated cheese factory. Overnight at guesthouse. Day 05Trek to Lama Hotel (2500meters) 6 hours. Morning visit around Kyangjin Gompa and afternoon return Lama Hotel, we take a route back to Lama Hotel following trail of we retrace our route, following the Langtang Khola to Langtang village and on to Ghora Tabela. We stop briefly for lunch and thereafter continue the steep descent to Lama Hotel. Overnight at guesthouse. Day 06Trek to Thulo Syapru Goan Tamang Village and will have a look. Walk through the Rhododendron forest...crossing few villages on the way. On the way Back, would like to invite you at Neupane Houses in Rasuwa and stay overnight and next day drive back to kathmandu on bus.